I'm not sure what it is. But when a book is written without quotation marks around the dialogue, it just seems to make an already sad and depressing book even more so. Now in their fifties, Gary and Irene have come to the conclusion that the unhappiness in life is totally the other person's fault, not their own. 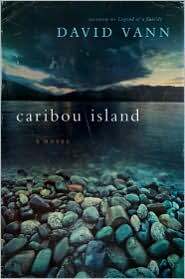 After thirty years of marriage and living in Alaska, Gary now has an obsession to build a one room cabin on Caribou Island, and Irene is supposed to help. No matter what, he will finish this cabin, even though Irene's truthful complaints of pulse-pounding headaches causing her to rest for hours at a time, have them visiting doctors to uncover a medical reason. Constant rain seems to pelt on them throughout the book as they work on the cabin, with arguments and deep despair building within them as each internally review the way their lives have turned out. And their children. Mark is the son who feels fulfilled (at least on the surface) to live by day as a fisherman in Alaska, and by night completely high on drugs. Rhoda is the daughter who is missing something in her life, and could perhaps be doomed to repeat her mother's mistakes. Living with Jim, a dentist, Rhoda doesn't know that Jim is just now realizing that if he does things right, he can probably get away with adultery for the rest of his life. Here's what's brilliant and realistic about this book: Although each character is disappointed, they also feel a closeness to the person they blame. They don't strictly hate each other, to a certain extent - while at one moment Gary may be ready to leave Irene forever, he still will lay down on the bed with her and hold her lovingly. There is a tenderness even though each of them are wondering if it's too late to make their life different. This is not a book to cheer you up. Effortlessly written, page after page sharing genuine insight into a life shaped with regret and "what if," David Vann builds an eerily quiet novel to shocking, and yet silent, conclusions. A quick read, it is disturbing, authentic, and frighteningly brilliant. I'd have to be in the right mood to read this, I think. The lack of quotation marks usually bugs me. bermudaonion - Yes, it took a bit to get used to. Once I did, it flowed, but it just seems to make it so much more haunting and sad...! There was virtually no punctuation in Saramago's Blindness, and it actually lent the book an urgent feel. I liked it. I've been seeing this book around, and I'm not really afraid of it. I like ones that make you think. Juju at Tales of Whimsey.com - It was definitely frustrating in the sense that I wanted some of these characters to wake up! :) Which is probably the sign of an excellent book, which this was. I like your review. But lately I've been putting depressing reads aside. Haven't been in the mood for awhile. One of these days though, I'll get back to being able to read mostly anything again. I borrowed this book from the library but later on, looking at the dark cloud hanging over the island on the cover, I returned it unread. Am in the mood for happier books! Good review. Wow! I really loved your post. I'd read other reviews of it, but for some reason yours truly got me to write down the book title so that I can remember to buy it. I'm not sure I'll read it now, since I'm not up for such a downer, but I know that I will want to read it sooner rather then later. Thanks! I haven't picked this up yet because I've been debating about it but something about it really intrigues me. I don't mind a sad book once in a while. I'm with Bermudaonion, I would have to wait to be in a certain mood to read this one. Oh boy, i seem to have some sad little guys in my future to read. This may have to wait. Thanks for bringing it to my attention though! Terrific review. I agree with all you had to say....just an "oh my God read". You used the word "sad" more than once. That means "skipster" in my language. Maybe someday, though. Isn't the cover a knock-out? Yvette - It is definitely a book to read, it just has to be at the right time! Harvee/Book Dilettante - Do pick it back up again when you're ready for it; it is definitely well worth it! Mrs. Q: Book Addict - Pick it up when you're in that mood and I promise you, I'm pretty sure you'll love it! Michelle (Read Headed Book Child) - Do read it and let me know what you think! It's an incredible read! Diane (Bibliophile by the Sea) - Thanks, Diane! You are so right - it is one in which the reaction can only be "Oh, my God." That is definitely how I felt when I finished those last few chapters! I'm looking forward to reading this one soon. I loved his first one and am hoping this one will be even better. Though it sounds dark, I am actually kind of excited to read this one. I think it would be interesting to get a birds-eye view into a marriage that has fallen apart, though I know that the punctuation issues may bother me somewhat. Great review, Natalie! Terrific review. I've been hearing great things about this book. I don't mind dark books (as long as I follow it up with something much lighter) and you've absolutely convinced me that this is one not to be missed. What a helpful review. I've heard nothing but good things about this book but right now I'm not in the mood for this type of book. Thanks for the insight. Zibilee - I think you'll enjoy this one, too, Heather! It is dark, but it resonates deeply and has beautiful character development. The struggles are heartrending, and it will leave you thinking about it! I can't wait to read what you think of it! Lisa - Thanks, Lisa! I'm with you, too - when reading something dark, I try to pick up something nice and light afterwards to bring me out of the "funk," if you will. I hope you enjoy Caribou Island, too - I'm glad I read it! Fantastic review. I am definitely compelled to read the book after reading your thoughts about it. Martha @ Hey, I want to read that - It is such a good, albeit dark book to read. Let me know what you think! Kathleen - Thanks! I look forward to your thoughts on it - it is one that most assuredly will keep you thinking about it! You have a way of getting right to the heart of a book. This book sounds compelling - I will add it to my list. The no quotation mark thing made me think of Mercy Among the Children by David Adams Richards. Another bleak character study filled with moments that cleave a reader in two. I'm not afraid to admit I enjoy a good depressing read once in a while. Becca - You are too kind, thank you! It is a compelling read - I can't wait to see what you think of it! Michael Ward - I agree, and I'm the same way. I do enjoy a good depressing read every now and again - and this one will be well worth it! I hope you enjoy! This one sounds really heavy, but also reallyyyy good. Loved your review of this. I don't think I'd have been interested if I just read a blurb. I really book to read this one. But like you said, it sounds really heavy, so I want to plan it better! I just finished reading this last night, and I agree with you. It's dark, disturbing, but incredibly atmospheric and well-written. It's going to be difficult to write a review though, because I can't say I really *enjoyed* it exactly. More like, I appreciated the book. You captured it so well in your review! Okay - not going to read this one, but you're review was wonderful.